Rachel Von | The Journal Gazette Saint Francis quarterback Matt Crable hands off to running back P.J. Dean during the Cougars’ Black-Blue Spring Drills on Saturday. Rachel Von | The Journal Gazette Saint Francis' P.J. 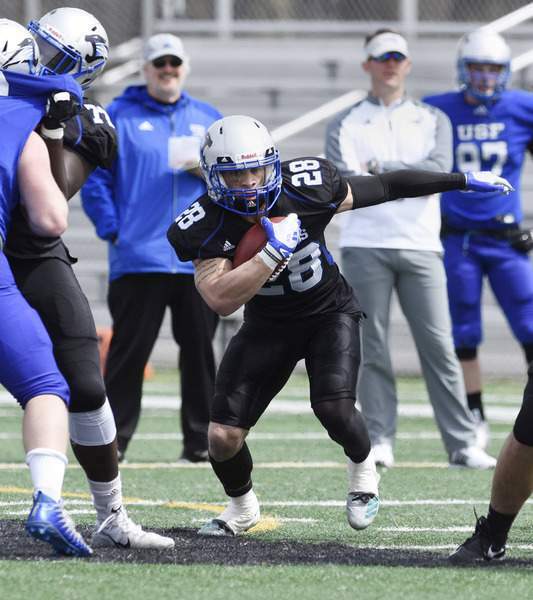 Dean finds an opening to run the ball through during the Saint Francis football spring game and final practice at Bishop John D’Arcy Stadium on Saturday. Rachel Von | The Journal Gazette Saint Francis quarterback Heath Simmons tries to keep a handle on the ball as he is tackled by his teammates during the Saint Francis football spring game and final practice at Bishop John D’Arcy Stadium on Saturday. Defense ruled the day at Saint Francis' Black-Blue Spring Drills on Saturday, at least on the scoreboard. 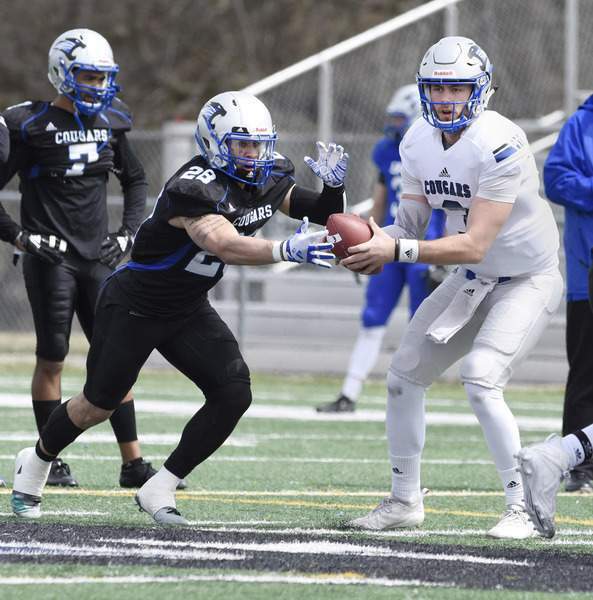 But Cougars coach Kevin Donley said that he thought the annual spring game, won by the Blue (defensive) team 36-15, was a lot more even that the final score indicated. “I'm not so sure about that scoring system – I thought it was pretty balanced,” Donley said of the spring game scoring, which allocated three points to the offensive team for every scoring drive and two for drives that reached the red zone, while giving the defense two points for a drive that reaches the red zone and three for a drive stopped before midfield. Still, Saturday's spring game did show that the defense that lost linebackers Piercen Harnish and Eric Dunten, the two leading tacklers in program history, might not take too much of a step back this season. Blake Schumacher, who Donley referred to as “the best safety in the country,” said the Cougars are showing that younger players will be able to fill in at least part of what the senior class left behind after last season. Cornerback Chrys Colley forced a fumble by wide receiver Casey Coll late in the 40-minute scrimmage, and defensive back Jack Rhoades recovered it. The coaches decided to play one final drive after the clock ran out, and Quinten Franklin Jr., quickly put an end to Black (offensive) team's last chance to score by picking off quarterback Andrew McCormick, who transferred from Indiana State in January. 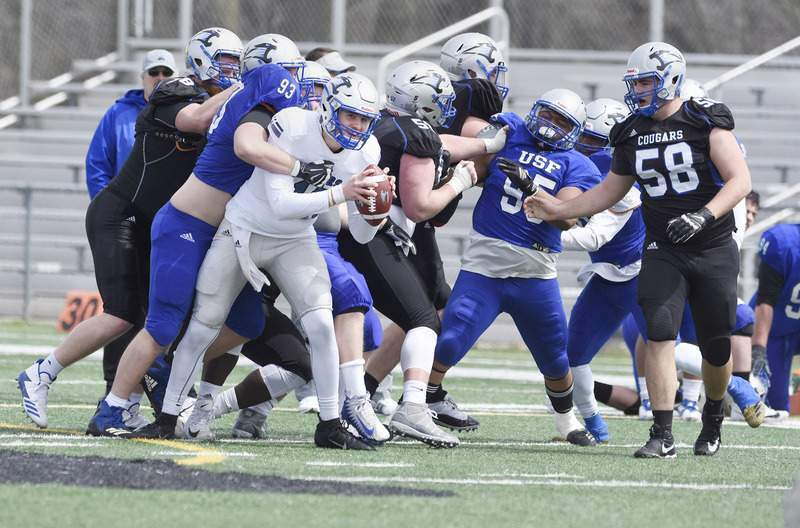 Quarterback Matt Crable, who started all 13 games for Saint Francis last season, opened the scrimmage portion of the spring drills with long pass to wide receiver Rocky James for a gain of 38 yards. It was the play of the day for Crable, who went 3 of 7 for 58 yards. Running back P.J. Dean scored the first touchdown of the scrimmage on a 10-yard run, and quarterback Clay Senerius hit Brock Bishop with a 10-yard pass for the second. Running back Tony Johnson earned a call-out from Donley after gaining 64 yards on 11 carries. Johnson, who gained 20 yards in two games as a freshman, ran for a 1-yard touchdown after the referees ruled his previous run just short of the goal line. Four defensive players (Zane Fisher, Christian Vela, Cordell McDonald and Ethan Theurer) recorded “sacks” for the Blue team. While most players said they were happy to get back on the field in front of spectators, Schumacher said the spring game is also a bit of a tease.